Carpentry construction is a very broad field covering many crafts and countless skills. Even journeyman carpenters must continue to learn and develop to keep pace with the changing demands of the job. Our journeymen courses keep you on the leading edge of your trade and build your leadership skills in the field. Courses focused on safety, technology, project management, methods and evolving industry codes ensure that you are the most effective and efficient journeymen you can be. Participants will learn how to take dimensions from a print and convert them to point coordinates and also how to calculate the distances and angles of layout points. In addition, they will learn how to set up a total station and configure the software to produce accurate results. Introduces the student to the proper procedures and protocols for safe working in an occupied health care facility. Course covers: methods of building barriers; administrative controls; work place etiquette; mold remediation; blood borne pathogens; and hazardous materials awareness. Students learn & practice procedures for the safe and efficient construction, alteration, and/or dismantling of welded frame, mobile tower, system, and tube & clamp scaffolds. Students receive Scaffold Erector certificate and qualification card from the UBC upon successful completion of the course. An introduction to site survey, this course focuses on instrument set-up, elevations and shooting a survey loop. Students will achieve course objectives through demonstration and competency-based performance tasks completed in the classroom and lab or shop. Students learn to interpret the Occupational Safety and Health Act 29, CFR 1926 and identify the common causes of accidents and fatalities in hazardous areas of construction. Students practice reading OSHA standards, learn the definition of “Competent Person,” and study the application of standards. Students learn the requirements of OSHA Fall Protection for Commercial/Residential Construction, encompassing related terminology, fall hazard recognition, selection and implementation of fall protection systems, inspection and use of fall arrest equipment, and the importance of overhead protection. Students successfully completing this course will receive two, two-year certifications. 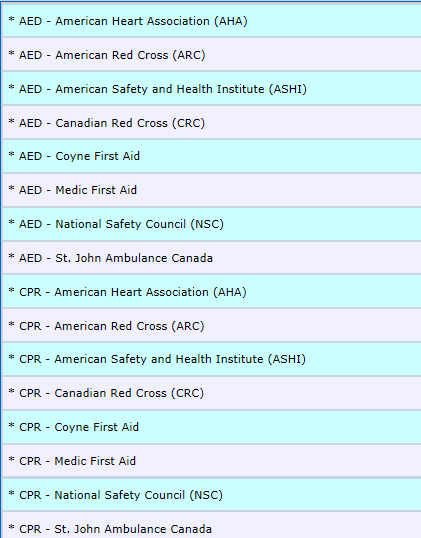 The Basic First Aid for the Community & Workplace is designed for individuals that require or desire a basic knowledge of first aid, while the CPR/AED for the Community and Workplace focuses on basic CPR/AED.